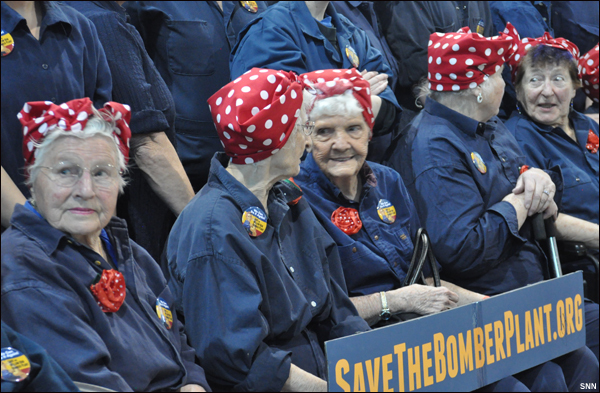 Oct. 16, 2017 – Forty-three original Rosies were part of 3,755 Rosies who gathered Saturday at Eastern Michigan University in Ypsilanti to set a new Guinness World Record for the Largest Gathering of People Dressed as Rosie the Riveter. A friendly rivalry with California for the record is keeping sales of Rosie apparel sizzling. Every generation rises to meet unique circumstances and challenges. In the early 1940s during World War II, millions of young men left home to fight in faraway lands in Europe, Asia, and Africa. And thousands of young women on the home front found themselves holding rivet guns at shipyards and airplane factories instead of sewing needles at home. Among the thousands of Rosies at the event were a few members of The Riveters, a FIRST Robotics team with 47 girls from Mercy High School in Farmington Hills, Michigan. Guided by David Gaines, the team’s mechanical mentor, the girls compete in district and national FIRST competitions, not unusual for girls in 2017. The bridge from rivets to robots was built almost 75 years ago, courtesy of original Rosies. “We’re creating women who make a difference,” Isabel’s mother said to Student News Net. Isabel, a senior, is the Strategy and Drive Lead for The Riveters. 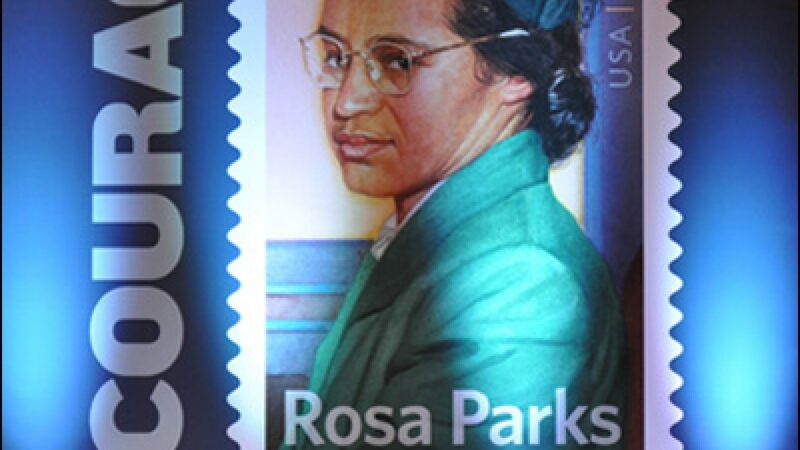 Since 2014, a highly spirited rivalry has been unfolding between Michigan’s Willow Run Bomber Plant, owned by the Yankee Air Museum in Ypsilanti, and the Rosie the Riveter/WWII Home Front National Historical Park in Richmond, Calif., one of more than 400 national park sites operated by the National Park Service (NPS). In 2014, Michigan set the record when 776 Rosies gathered on March 29 at one end of the original Bomber Plant, built by Ford Motor Company in 1941. At its peak, the factory was producing one B-24 Liberator bomber every 59 minutes with a workforce of more than 40,000 people, including thousands of women – original Rosies. Through the efforts of the Yankee Air Museum, one end of the Bomber Plant was saved from demolition in 2014 and will be the museum’s new home after an extensive renovation in process now. 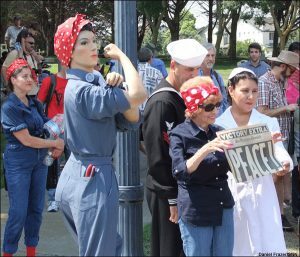 On Aug. 15, 2015 to celebrate the 70th anniversary of the end of the war, California took the record back at a Rosie Rally attended by 1,084 Rosies, including Elinor Otto, 95, an original Rosie. She worked as a riveter until 2014 when she was laid off because the Boeing factory in Long Beach, Calif. where she worked closed! She has her rivet gun as a memento of her momentous career. It didn’t take long for Michigan to respond. On Oct. 24, 2015, 2,097 Michigan Rosies reclaimed the record. The record only held for 10 months though. On Aug. 13, 2016, through its annual Rosie Rally, California was again the record holder with 2,229 Rosies. It’s the current Guinness World Record as posted on their website. Not to be deterred by a mere 2,229 Rosies, Saturday at the Eastern Michigan University Convocation Center, hundreds and hundreds of Rosies, from 18 states and Canada, enthusiastically filed into the arena throughout the morning until 3,755 Rosies were deemed authentically dressed as Rosie the Riveter. To be counted, apparel requirements included the iconic bandanna, dark blue overalls or dark blue pants with a blue shirt, red soccer socks, and dark work shoes. The lunch pail made famous by Norman Rockwell’s Saturday Evening Post magazine cover of May 29, 1943 was optional. The arena was a sea of red, white, and blue – and polka dots – from high in the rafters to the front rows where the 43 original Rosies took their place of honor for the official count. Remarkably, the age range of Rosies spanned more than a century, from 6 weeks to 110 years old. Officials from the Guinness World Records were there to verify that 3,755 Rosies were in place for 5 minutes. During the five-minute period, the event’s emcee led the crowd in the national anthem, the Pledge of Allegiance and other patriotic songs. The event ended with Alison Beatty, Yankee Air Museum public relations committee member, first leading all of the Rosies in a rousing rendition of a Rosie song and then announcing the official count. Ending on time, Alison said when women get together, they are unstoppable. It was an incredible day honoring Rosie, bringing generations of women together, and keeping history alive. What fun it will be to watch the next chapter in this riveting rivalry! Student News Net had the honor of interviewing three original Rosies at the event. Mae Krier, 92, of Levittown, Penn., Phyllis Gould, 96, of Richmond, Calif., and Helen Kushnir, 91, born in Dearborn, Mich., all original Rosies, spoke of sharing a common bond because of their experiences. Helen noted that her mother was not pleased when she went to work at a factory because she wore pants. Ladies did not wear pants in public, her mother felt. Phyllis was trained as a welder in the California shipyards during the war. She said at first she was not given the same difficult welding jobs as men so she devised a way to be included in those jobs. She was paid the same wage as her husband who was also a welder. But he could not reconcile that she was his equal in skill and pay so he left her. She became a single mother with a young son. Her family helped her through this time. Eventually, she remarried. Mae worked as a riveter in Seattle at a Boeing airplane plant. She said Gen. Hap Arnold of the Army Air Corps would visit the plant and express admiration for the work the women were doing. She said that during the war, everyone pulled together regardless of their background. Brenda McKinney, current Superior Township Treasurer who accompanied Mae to Saturday’s event, said Mae, and the millions of Rosies she represents, had an incredibly positive impact on African American women, helping to redefine their roles in society as well. According to a 1945 report to the Department of Labor, from 1942 on, large numbers of African American women, all Rosies, were working in steel mills, aircraft plants, and shipyards performing jobs normally done by men to meet production demands during WWII. Mae and Phyllis have been advocating for a long time for an annual National Rosie the Riveter Day. They are making progress. On March 15, 2017, a resolution passed Congress declaring March 21, 2017 as National Rosie the Riveter Day but now Mae and Phyllis want it to be a permanent resolution. They encourage everyone to write their representatives in Congress to advocate for it. The effort in Congress is being spearheaded by Sen. Robert Casey, Jr. (D-Penn.) and strongly supported by Rep. Debbie Dingell (D-Mich.), who spoke at Saturday’s event. Mae is also active in the Twilight Wish Foundation, a foundation that grants wishes to senior citizens.